What are the plug-in hybrids? What does our calculator do? Should you buy a PHEV? Most electric and hybrid cars allow you to save considerable sums on fuel but require a large initial investment. It is difficult to decide at the first glance whether a hybrid is more cost-efficient. We created this handy calculator to give you a comprehensive overview of the economy of plug-in hybrids. You will be able to calculate the real-life MPG of such a car and compare the energy expenses of plug-in hybrids and regular cars. The main difficulty in determining the PHEV cost-effectiveness is that it is largely dependent on your driving style. The purchase of such a vehicle is justified if you make a lot of short trips. Once you deplete the battery and switch to gasoline, though, it is only as good as a regular car. To calculate the MPG of your PHEV, determine how many trips you make within and beyond the battery-only (EV) range. For example, if your only trips during the month are for commuting - let's say, 15 miles on every workday - then you can assess your monthly mileage as 20 * 15 miles. Estimate how many long-distance trips you make each month, too; for instance, you can make a 400-miles journey twice a month to visit your parents. As our calculator already aggregates the most important data concerning energy consumption of plug-in hybrids, there's no need for you to do a thorough research. All you have to do is choose a car from the list, and our calculator will tell you how much you will save on fuel. Plug-in hybrid electric vehicles (PHEV) are cars that use two propulsion methods. The first is an internal combustion engine, fueled with gasoline, just like in traditional cars. The second is an electric motor with a rechargeable battery. Unlike regular hybrid vehicles (HEV), plug-in hybrids operate primarily on the electric motor. They are able to use only the battery without drawing any energy from the combustion engine. Once the battery reaches a certain low state of charge, the car switches to gasoline as the main propulsion method. On short distances, the PHEV will not use the gasoline at all - it is used only to extend the battery-only (EV) range of the car. The further difference between plug-in hybrids and traditional hybrids is that the battery in PHEV can be recharged from the grid. Most producers provide a possibility to charge the car from a standard plug socket. You can also use dedicated charging stations. The batteries of HEV are typically recharged on board, for example during regenerative breaking, when kinetic energy is recaptured. Estimating the fuel costs of a regular car is not a difficult task. All you have to do is to find its MPG (miles per gallon) value in the specifications, determine your monthly mileage, and perform a simple division to obtain the cost of fuel per month. The calculations become more daunting when you are trying to find the energy costs of a PHEV. As it switches between two propulsion methods, you have to estimate the mileage within and beyond the EV (battery-only) range separately. Only then you can find the real-life MPG of the plug-in hybrid that will correspond to your driving style. Intuitively, the plug-in hybrids are the best solution for drivers who primarily operate on short distances. They are able to charge their car's battery frequently and spend months without burning fuel. On the other hand, a driver who often makes long trips will quickly discover that the real-life MPG of his plug-in hybrid does not differ much from the MPG of a car not equipped with an electric motor. Begin your analysis with choosing a plug-in hybrid from a range of available models. Our calculator allows you to choose one of the models listed in the table below. All data comes from fueleconomy.gov and from their 2017 Fuel Economy Guide. You may provide your own values if your vehicle is not on the list. The next step in calculating the MPG of your plug-in hybrid is to analyze your driving habits. Divide all the car trips you make during a month into ones that do and do not exceed the car's EV range. You need to provide our calculator with the average distance of a trip and the number of trips per month for each of these categories. Our plug-in hybrid economy calculator assumes that the car operates either on battery only, or - when the battery is depleted - on gasoline only. It is a necessary simplification, as many vehicles can also operate in a so-called "blended mode", where the two propulsion methods are applied simultaneously. Nevertheless, it is a good approximation, especially for drivers who make most of their trips within the EV range. MPG is the fuel efficiency of the PHEV operating on gasoline only. Apart from the MPG of a plug-in hybrid, our calculator can also determine your expenses on gas and electricity. All you have to do is provide the price of fuel per gallon and of electricity per kWh in your area. When choosing the price of electricity, double-check whether you can use a tariff with a variable price per kWh depending on the time of the day (tiered electricity pricing). If so, you can open the advanced mode to type in two different electricity prices. You can assign a different percentage of total charging time to each of them. You can also use these fields if, for example, you charge your car for free at your workplace. Then, simply set the tier 2 electricity price to $0/kWh. Our calculator will automatically display the total monthly cost of using a plug-in hybrid. You can also open the advanced mode to see the cost split into the gasoline and electricity parts. Now that you know your monthly energy expenses, you can compare the selected plug-in hybrid vehicle with any regular car that operates solely on a combustion engine. All you have to do is to find the MPG of this car on its producer's website. Choose the value that best corresponds to your driving habits - for example, if you only use your car in the city at low velocities, choose the "city fuel economy" type. On the other hand, if most of your trips are done at high speeds, "highway fuel economy" will be more suitable. Upon entering the MPG of the traditional car, our calculator will automatically determine the fuel costs basing on your driving habits and monthly mileage. It will also display how much money you will save each month if you settle for a PHEV instead. Every plug-in hybrid vehicle will be cheaper than a regular car when it comes to fuel and energy expenses. It doesn't necessarily mean, though, that the sum you have to invest will return to you. When you open the advanced mode of our calculator, you will discover an additional section at the very bottom. You need to enter the price of a regular car and the price of a charging station, if you wish to install one at your own house (if you already have a station or don't want one, type "0" into this box). Also, input the value of the government incentive/grant (if you receive any). Then, the calculator will compare the costs of PHEV and the regular car and tell you after how many years will the investment be returned. Toll exemptions: In many countries, PHEV or HEV owners can use the highways without paying the toll. Insurance and maintenance: The rates may be different for hybrid and regular cars. 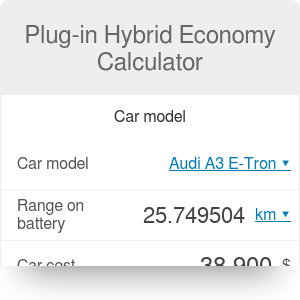 Plug-in Hybrid Economy Calculator can be embedded on your website to enrich the content you wrote and make it easier for your visitors to understand your message.